NBA guard Garrett Temple joined in as the congregation at Alfred Street Baptist Church in Alexandria, Virginia, gave a standing ovation Sunday morning to a policewoman who had come to services in her uniform. It was only as he walked out of church that Temple checked his cellphone and learned that three police officers had been shot dead and three others wounded in his hometown of Baton Rouge, Louisiana. “I was so happy to see a positive officer in uniform. I left from church, where people were being so positive to a police officer, to something terrible going on in my city. It brought me down. It’s terrible,” he told The Undefeated in a phone interview Sunday. 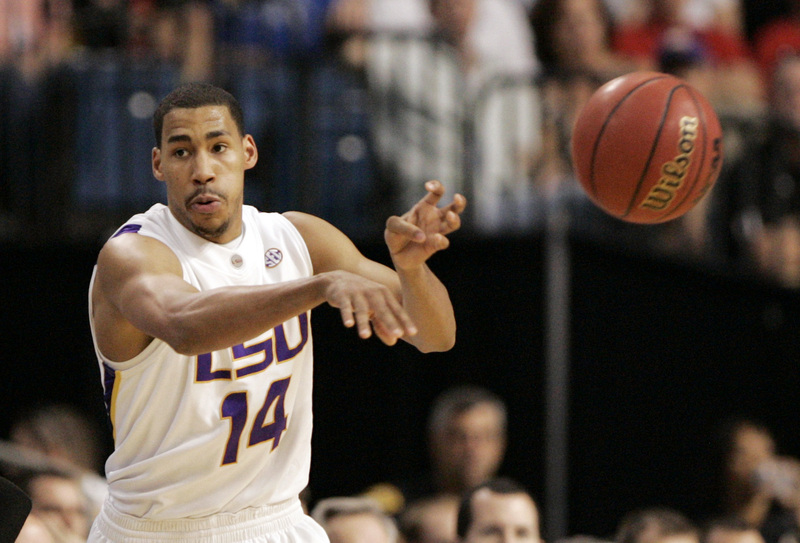 March 14, 2009; Tampa FL, USA; LSU Tigers guard Garrett Temple (14) passes the ball against the Mississippi State Bulldogs during the second half of the semifinals of the 2009 SEC Tournament. Temple, 30, was a high school star at University Laboratory School in Baton Rouge and at Louisiana State University. The six-year NBA veteran spent the last four seasons with the Washington Wizards and recently signed with the Sacramento Kings. Temple, the son of former ABA San Antonio Spurs forward Collis Temple, said he had been so depressed by the recent news of the police shootings of African-American men in Baton Rouge and Minnesota and the shooting deaths of five police officers in Dallas that he turned off news notifications on his phone. But text messages brought word of another tragedy back home anyway. “Killing cops is no answer at all. Killing is not right at all,” Temple said. “I’m a God-fearing man. I pray for my city. I am praying for the world right now. There has been something bad going on in the world every day of late. Today, it was Baton Rouge again. Temple is not a household NBA name. He has averaged 4.5 points, 1.8 rebounds and 1.4 assists in a career that has included stops with the Kings, Houston Rockets, San Antonio Spurs, Milwaukee Bucks, Charlotte Bobcats and Wizards. The 6-foot-6, 195-pounder averaged career-highs of 7.3 points and 2.7 rebounds last season with the Wizards. He agreed to a three-year, $24 million contract with the Kings earlier this month. He is a well-known name in Baton Rouge, though, where he has an off-season home. He was already scheduled to fly home on Sunday night and he is hoping his celebrity there can be used for good after this recent stretch of horrible news. Temple said he was harassed by white cops while growing up and his brother dealt with some brutality at the hands of police. So he was not surprised when African-American Alton Sterling was killed by police there on July 5. “I didn’t know Alton Sterling, but I had seen him around before,” Temple said. “I reached out to several police officers to have a conversation on what happened. Ten out of 10 said what happened was wrong. Nine out of 10 said it should not have come to that. He hopes to connect with former NBA and Louisiana State University forward Tyrus Thomas and local politicians to see what they can do.